Remember this Overnight French Toast Soufflé from yesterday? Remember how I also said that we had a big brunch a couple weekends ago?… Well, by big- I meant, we had TWO overnight yummy casseroles for breakfast! The Overnight French Toast Soufflé was perfect for the breakfast sweet tooth, but today’s casserole is perfect for you salty savory lovers! My mother-in-law gave this recipe and I absolutely LOVE it! I am a huge spinach and tomato fan and this really hit the spot! An easy meal to fix and jam packed with great flavor! In a large bowl, whisk together eggs, half and half, onion powder, salt and black pepper until thoroughly beaten together. Layer white bread in a single layer, butter side up, on the bottom of greased 9x13 pan. You may need to trim the pieces to evenly cover the bottom. For the second layer, evenly sprinkle the cheddar cheese over the top of the bread. For the third layer, evenly distribute chopped/diced tomato over the top of the cheese. 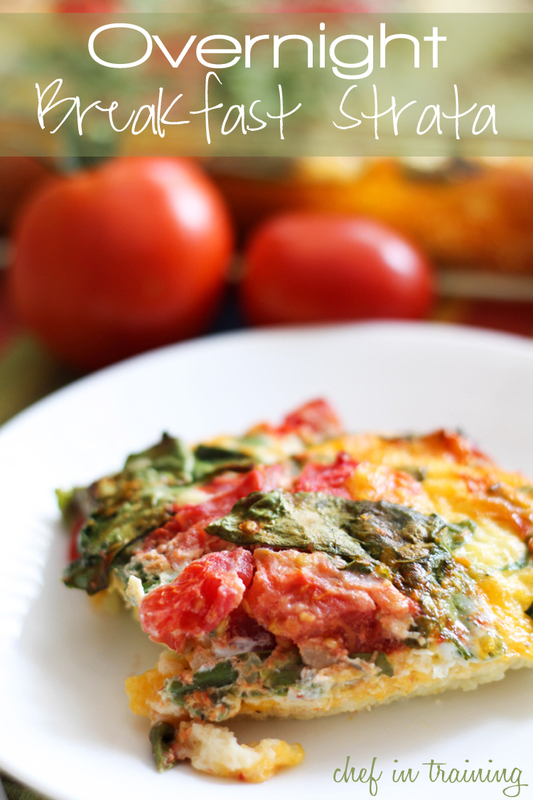 For the fourth layer, evenly sprinkle spinach over the top of the tomatoes. Evenly pour egg mixture over the top of your casserole. I like to press down my layers a little bit to ensure all is covered by egg mixture. Cover casserole and refrigerate at least one hour and up to overnight. Bake at 350 degrees F for 35-45 minutes or until cooked through. I'm seriously drooling. I wish this was on my breakfast plate because holy cow, it looks beautiful and delicious! Anything with a dozen eggs in it is destined to be pretty darn good :) looks awesome! We love brunch. And easy, overnight recipes are the best. This looks beautiful! Oh MY! And I thought the French Toast Souffle was AMAZING... .I LOVE savory breakfasts. This is right up my alley! I'm a total fan of overnight everything. I have no reason. It's just something about my food getting yummy all night for breakfast. Just had this and love it, delicious! I had just one question, my was a little runny, is that normal or is it due maybe to my tomatoes? Thank you so much for sharing your recipes, I love your blog! This looks great but I'm the only one in the house who eats tomatoes. Any suggestion on substitutions? Made this last night, halved the recipe since there are only 4 of us. Had to bake it approximately 20 minutes longer than suggested, very runny! I even spooned out some of the egg since we were on a time constraint. But it tasted really good and looked nice too. Thanks for sharing! Made this for breakfast-for-dinner night. Looks great so far. Still cooking though. So far it's been cooking 15 minutes longer than listed. Will probably cook another 5-10 minutes. Looks yummy though! Hmmm wondering if it should be a 1/2 quart of half an half? Been cooking for over an hour ans still liquid in the center. Looks delicious! I think I will substitute spinach for mushrooms! This looks so yummy!! I LOVE stratas! If only I could get my family on board with their deliciousness! I made this and I agree with the others...it needs only 1/2 quart of half and half. Still yummy though! Could I use milk instead of half and half? What is half and half??? In the recipe's. I am aussie. The recipe isn't showing on this web page. Could you please email it to me? Looks delicious! Do we use shredded cheese or just use big squares of cheese to cover it with? Looking forward to making this for my family this Mothers Day.